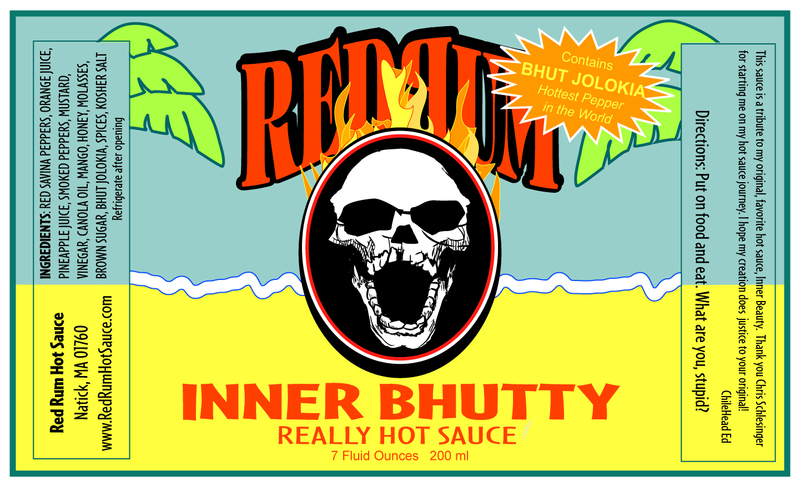 With the introduction of the new Bhut Jolokia pepper, Redrumhotsauce.com has just announced their newest sauce, the Inner Bhutty Island Sauce. There’s a great story behind it, so be sure to check it out. Inner Bhutty is made by Ed Rome, and since he and his company Redrumhotsauce.com is a small batch manufacturer, you’ll want to get your hands on this stuff before it sells out. This year I only made 1 sauce, I took all the peppers from my harvest, Bhut Jolokia, Habanero, Jalapeno, Bird’s Eye, Hungarian Wax, Serrano and Thai, smoked them over Hickory wood, made a mash and used them for this sauce. No extracts, no preservatives, just flavor and heat! It is called… INNER BHUTTY! This sauce is a tribute to my old time favorite, Inner Beauty. Why Inner Beauty is no longer made is a mystery, but people keep looking for it and asking for it! It was the first “super hot” sauce I fell in love with back in the 80’s and still my favorite today. It is an island style sauce with Mustard, Curry, Mango and Pineapple with a twist…Bhut Jolokia! Sweet and flavorful up front with a slow building burn after. My personal opinion is that this is the best sauce I have ever made, the few testers so far seem to agree…I hope you think so too! With the economy the way it is, I priced it accordingly; it is 5 dollars a bottle, (7 ounce flask). Email me or order it from the website RedRumHotSauce.com , the website has a 10 dollars shipping for all you want to order price and you can pay with PayPal, but if you just want 1 bottle I can ship it for less. For you collectors out there, Redrumhotsauce.com also has an extensive collection of one-of-a-kind bottles that are sure to please. Twitter folks, follow RedRum on Twitter as @redrumhotsauce and tell them HotSauceDaily sent you. Looks like awesome stuff. I just ordered my bottle. I LOVED Inner Beauty! I worked at an oyster bar that had a million different sauces, and that was always my first choice and recommendation. When will you be making more of your homage? You’ll have to contact Ed over at Redrumhotsauce.com for that info.